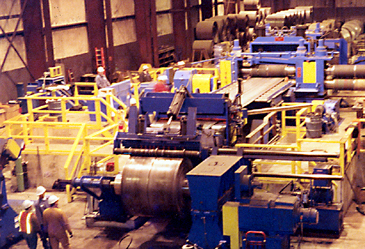 Armorel, AR - Maverick Tube has installed a massive Braner/Loopco slitting line to produce high-strength heavy-gauge slit coil at its Armorel, AR structural tube facility. 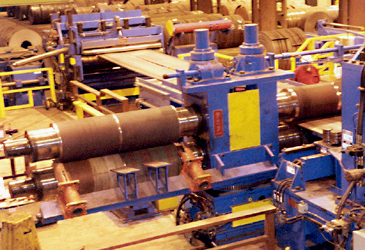 The new "Turret Head " slitting line is designed to process 90,000# x 84" wide 100,000 PSI yield strength hot rolled coil in gauges from 5/8" down to 14 gauge. More than 1,100 HP is employed to process the high-strength heavy-gauge coils at line speeds to 420 FPM. Coil Storage & Loading: 90,000# x 84" OD master coils are staged at the entry end of the line on coil saddles. 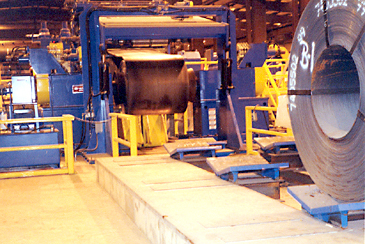 A hydraulic coil buggy retrieves coils from the saddles and loads the coils onto a Cone Uncoiler. The cones handle 20"-34" ID coils. A massive Coil Hold-Down anchored to the floor snubs the coil outer wrap and assists threading the coil. 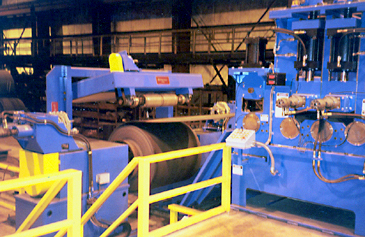 The powered hold-down roll "floats" in its frame to allow the coil to be laterally positioned while the roll is engaged. Entry Section: The lead end of the coil is peeled and fed into Entry Pinch Rolls and a 5-Roll Straightener. The Straightener removes coil set curvature allowing for faster strip threading, and removes the coil "tail hook" during tail-out. Electronic digital readouts indicate the motorized screw jack straightening roll elevations, while quick-open hydraulic cylinders open and close the flattening rolls without changing the roll gap setting. The flattened strip is advanced into the Cropping Shear where the coil head end is cut square. The Cropping Shear is equipped with powered "ejector rolls" to eject the scrap coil tail into the Scrap Cart. Scrap generated from head and tail end cropping is collected in a Self-Dumping Scrap Cart that allows for hands-free scrap disposal. Two (2) sets of hydraulic cylinder positioned hardened tool steel Roller Side Guides are employed to guide the strip as it feeds into the Turret Slitter. Turret Slitter: A huge 15" arbor x 84" two-head quick-change Turret Head™ Slitter is included to slit the high-strength 5/8" to 14-gauge strip. 14" thick precision machined solid steel plate bearing housings weighing more than 7,000# each support the arbors in tapered roller bearings. 150 ton motorized screw jacks are attached to the bearing housings to support the slitter arbors. Power for threading and loop slitting lighter gauges is provided by a 400 HP-DC drive.